Striving to be the best, not the biggest! Coin Collections; Canada, Proof Dollar Lot, 44 various proof dollars in cases, all issued by the Royal Canadian Mint, ranging from 1979 to 2002, slight dupl., approx. two for each year. 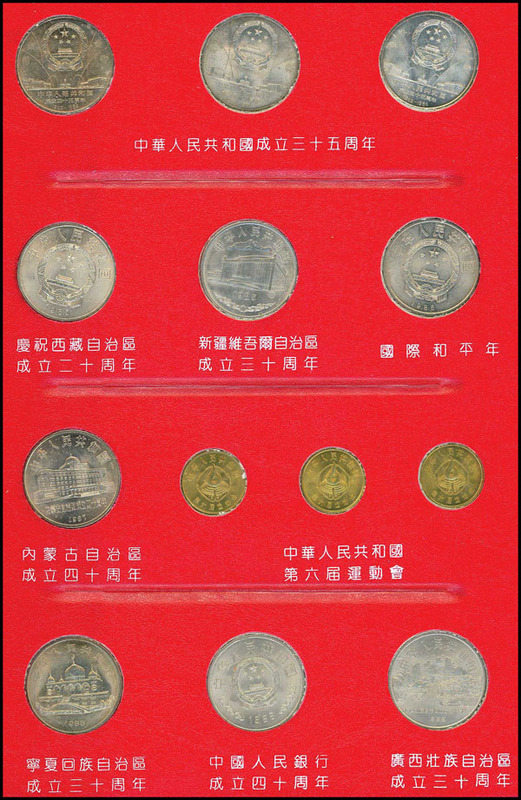 Coin Collections; China (People's Republic), 1984-1991 Uncirculated Coin Set, album of Commemorative coins, extremely rare and hard to find, complete set of 24 coins. 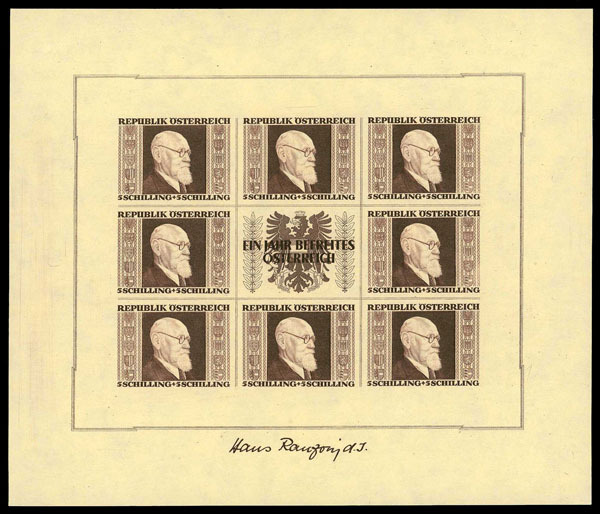 Austria, 1946 Renner Miniature Sheets Complete, Michel #772B-775B, n.h., attractive set, Extremely Fine. 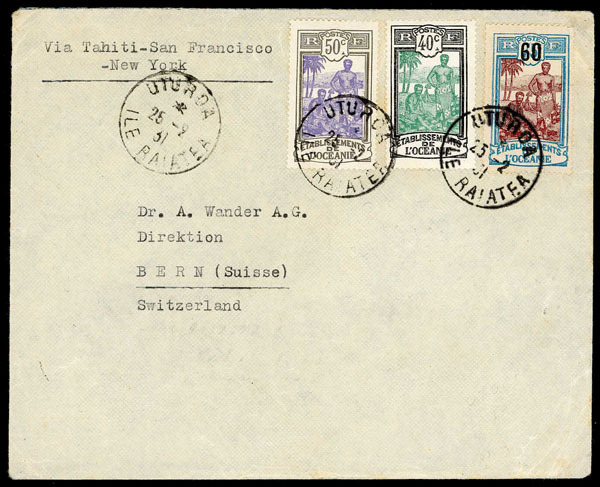 French Polynesia, 1931 Uturoa, Ile Raiatea Cover, Maury #33, 35, 60, to Bern, Switzerland, via Tahiti, scarce. Ex Ernst Sielaff Estate. 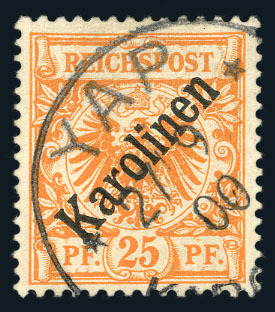 o German Offices in Morocco, 1911, 35c on 30pf Orange & Black on Salmon, Michel #51y, Rabat cancel, Fine to Very Fine, signed Bothe, 2008 Steuer cert. 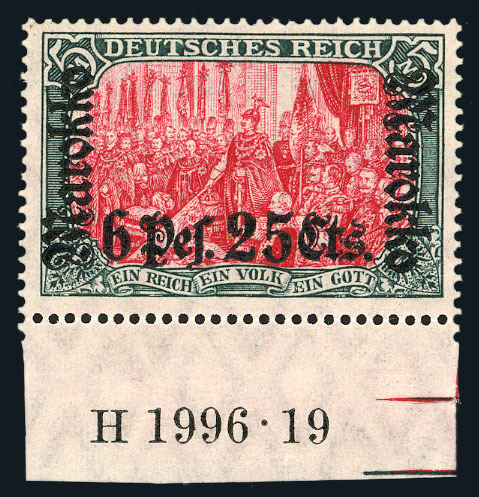 German Offices in Morocco, 1911, 6p25c on 5m Slate & Carmine, With Han #, Michel #58A, n.h., #1996-19, centered, Very Fine, 2012 Jaschke cert. 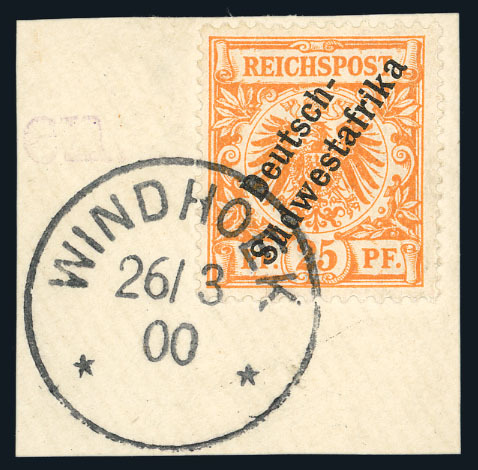 German South West Africa, 1898, Imperial Eagle, 25pf Orange, Michel #9 a, complete Windhoek 26/3/00 cancel on piece, Very Fine, signed Bothe. 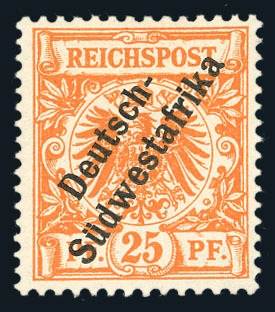 German South West Africa, 1898, Imperial Eagle, 25pf Dark Orange, Michel #9b, o.g., fresh, Very Fine overall, Jaschke 2012 cert. 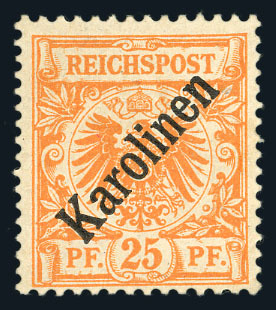 Caroline Islands, 1899, Imperial Eagle, 25pf Orange, 48 Degree Overprint, Michel #5 I, n.h., Fine to Very Fine, signed Pfenniger. o Caroline Islands, 1899, Imperial Eagle, 25pf Orange, 48 Degree Overprint, Michel #5 I, Yap 27/9/00 cancel, Fine to Very Fine, signed. 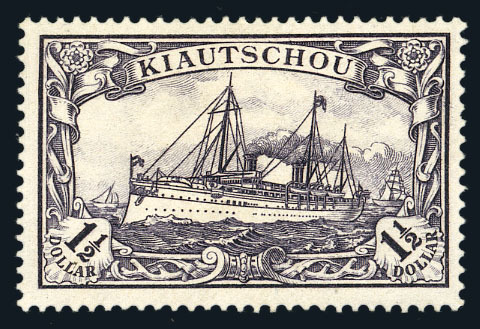 Kiauchau, 1905, Yacht $1½ Black Violet, Michel #26A, l.h., nicely centered, Choice Very Fine, signed Bothe, 2012 Jaschke cert. 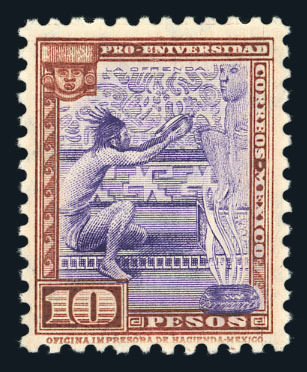 Mexico, 1934 University 10p, #706, l.h., fresh, Fine to Very Fine. 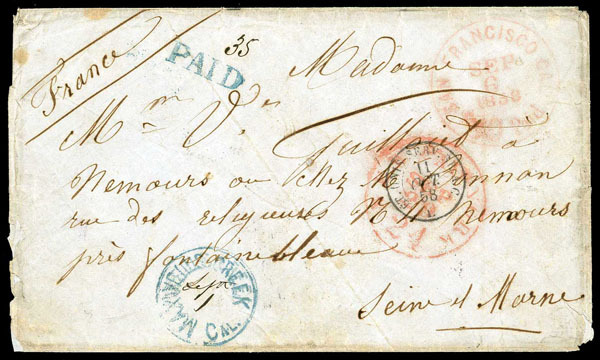 Great Britain, 1840, 1d, Plate 6, 1841 "Too Late" Cover, SG #2, RE, State 2, touching to ragged margins all round, tied by black Maltese Cross to 16 May 1841 entire from Bolton to London, letter was originally submitted as paid in cash ('1' in red crayon), then cancelled and the 1d black applied, collecting a 'TOO LATE" mark verso, vert fold, clean, Very Fine. Scott #1 $640+. S.G. Spec. #AS42. 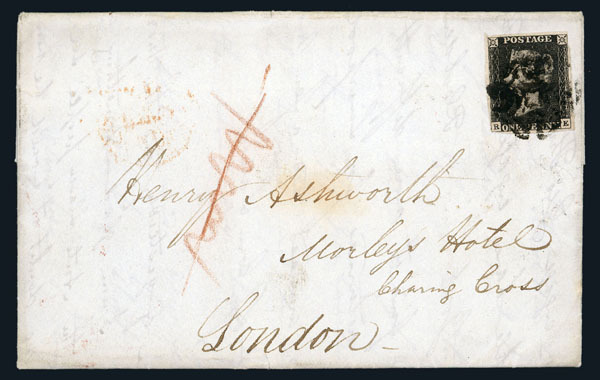 Great Britain, 1840, 1d Group of May Date Covers, SG #2, 6 covers and one large piece (not counted), somewhat poor condition overall, from May 15th to May 29th, complete descriptions incl., inspect, Fine to Very Fine lot. Complete identification of each cover supplied by "My Penny Blacks". SG £17,100+. Scarce group in any condition . o Great Britain, 1884, Queen Victoria, £1 Brown Lilac, Imperial Crowns Watermark, SG #185, partial multiple cds, faint diagonal crease, Fine to Very Fine. o Great Britain, 1888, Queen Victoria, £1 Brown Lilac, Orbs Watermark, SG #186, indistinct cancel, a sound example, Fine to Very Fine. 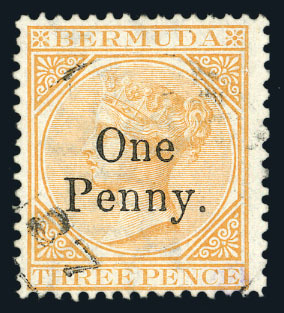 o Bermuda, 1875, Queen Victoria, 1d on 3d Yellow Buff, SG #16, lightly cancelled, excellent color, Choice Very Fine, 1986 P.F. cert. Scott #14 $425 (fine grade). SG £350. Considerably better than the usual condition for this . 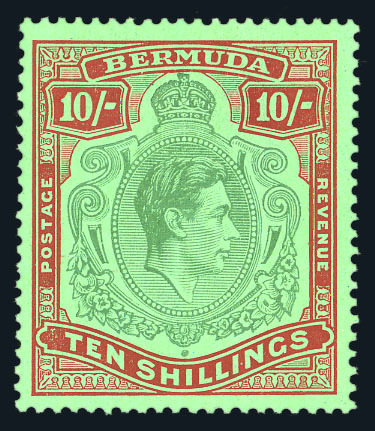 Bermuda, 1938, King George VI, 10/- Green & Deep Lake on Pale Emerald, Perf 14, Chalky Paper, SG #119, l.h., Very Fine, 1986 P.F. cert. 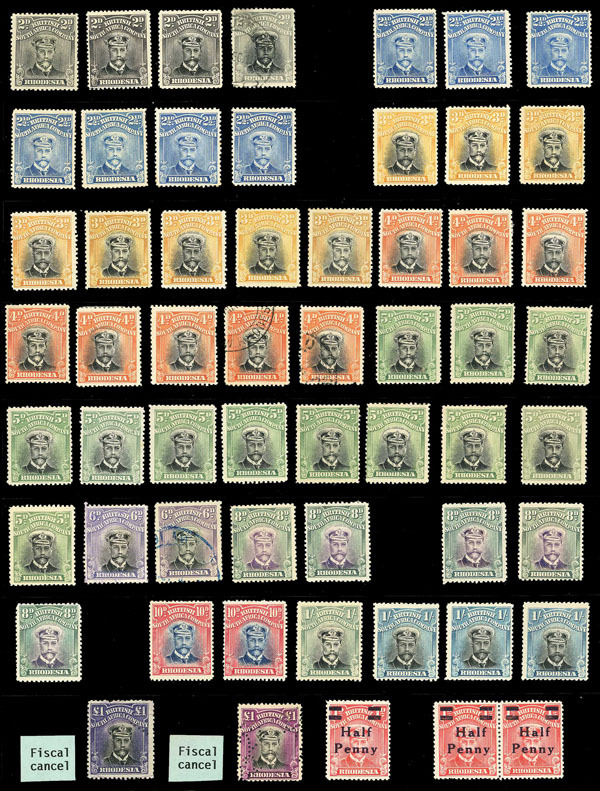 /o Rhodesia, 1913-1923, King George V "Admiral", ½d to £1 Study Group, SG #187/243, selection of over 100 mint, various shades and about 60 used with fiscal cancels, Fine to Very Fine. Autographs; United States, Presidents; McKinley, William on 1893 Notary Public Commission (1843-1901) 25th President of the United States, 1897-1901, Signature as Governor of Ohio, very attractive. U.S.; State Postal History, California: 1850's Illustrated Miners Camp Scene, #11, sound, from New York to New Canaan CT, fully illustrated on back with miners mountain scene showing bear and tent, F.C.M. Fenn, San Francisco, Cal. imprint, "repaired corners and edges incl. the addition of a new edge along the top". Ex Jessup, Haas, Kurtz, illustrated in Gold Fever by Ken Kurtz page 61. 2008 P.F. cert. The only recorded cover with this design . 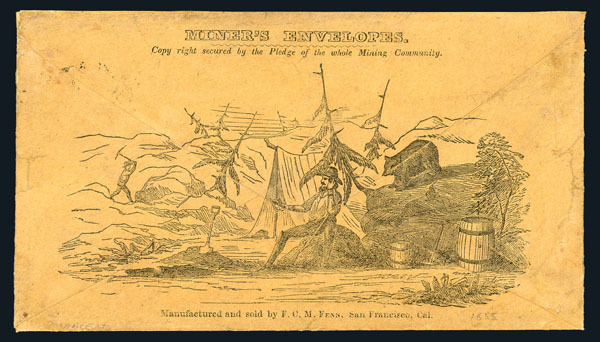 U.S.; State Postal History, California: 1850s Gold Panning Illustrated Stampless, JUL 12 New York to Michigan, illustrated depicting miner panning for gold with Long Tom in background, with imprint J.M. Hutchings California, 2 brown areas on back, otherwise Fine to Very Fine. 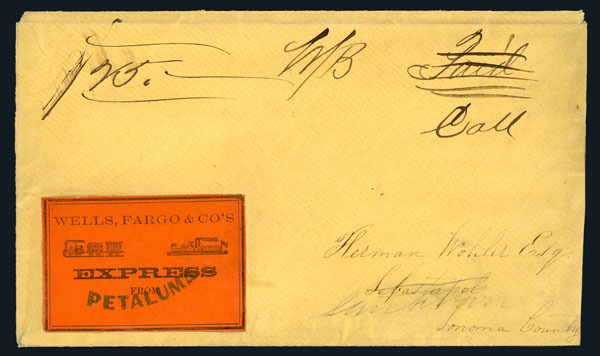 U.S.; State Postal History, California: 1850's Petaluma Wells Fargo Express, to Sebastopol forwarded to San Francisco, black on orange label (Mosher WFCX-L545), manuscript express charges, red wax seal on back, reduced right edge and opening tears at back. 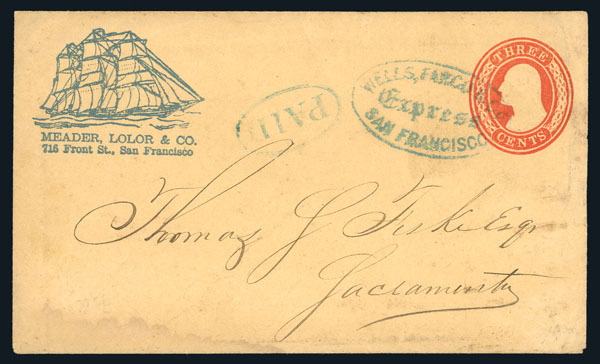 U.S.; State Postal History, California: 1854-60's San Francisco Wells Fargo Cover, #U10 with blue Meader, Lolar & Co illustrated full rigged ship corner card, blue oval handstamp with matching Paid in oval, accompanied by newsprint advertising clipping for shipping and Commission, light water stain at bottom left. 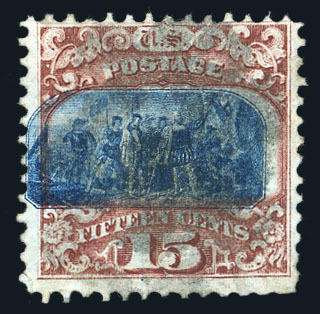 U.S.; State Postal History, California: 1858 Maxwell Creek Stampless, to France (Williams MAR-1660), San Francisco 24 in red, blue Paid with manuscript 35, some soiling and wear at edges, Fine. 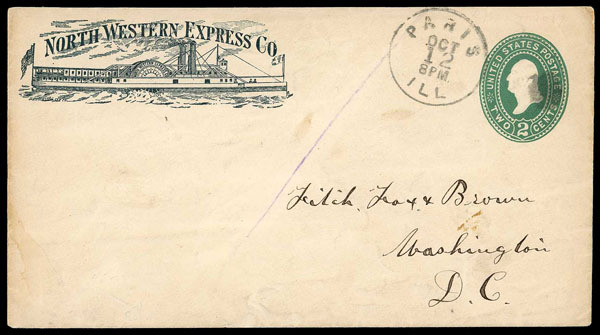 U.S.; State Postal History, Illinois: 1888 North Western Express, Paris, IL to Washington, D.C., illustrated steamboat corner card on 2¢ green entire, pen mark partially erased, a Fine cover. 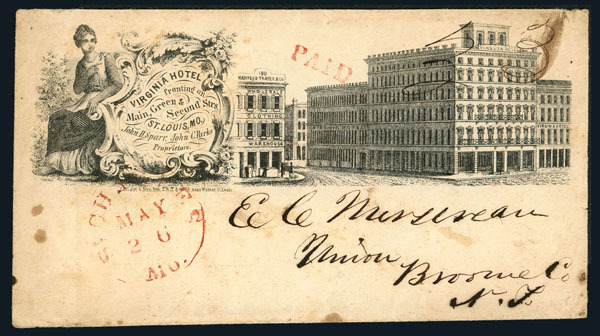 U.S.; State Postal History, Missouri: 1854 Illustrated Hotel Stampless Cover, to Union, N.Y, ornate Virginia Hotel, St. Louis, Mo. corner card with illustrated female figure and hotel view, red St. Charles Mo., May 26 cds and matching straight line Paid handstamp with manuscript 3 rate, small stains. 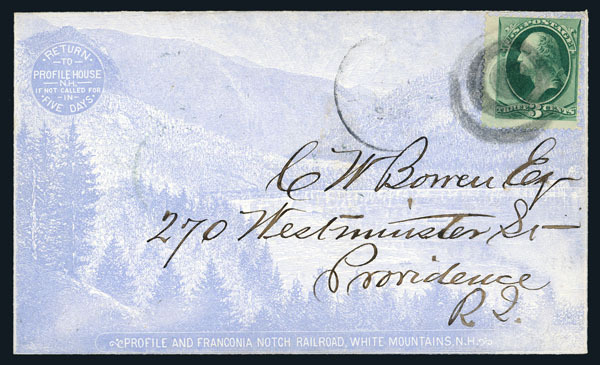 U.S.; State Postal History, New Hampshire: 1880's Illustrated Railroad, #184, to R.I., Profile & Franconia Notch Railroad, White Mountains N.H. all-over mountain view design in ultramarine, very clean, Very Fine. U.S.; State Postal History, Oregon: 1862 Eugene City, O.T. Usage, petite cover with #65 (faulty) with black target and Aug. 10, Eugene City, O.T. cds; slightly reduced at right, Just Fine. Addressed to George Riddle, Company 1st Oregon Volunteers, Jacksonville, Oregon. 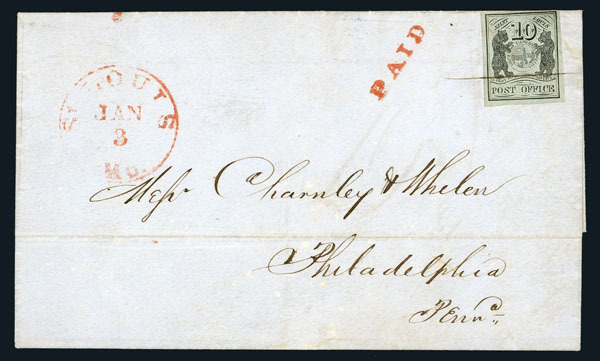 U.S.; State Postal History, Pennsylvania: 1771 Philadelphia Stampless, PHILA / DELPHIA red two line postmark and matching "16 NO" datestamp well struck on side flap of 1771 folded letter from Philadelphia to Salem, Mass., magenta manuscript "4" (dwt) rate and "10/" local currency equivalent at top left, fresh and very fine for this. Letter of D.G. Rundle regarding shipping matters and the market for commodities at Philadelphia. 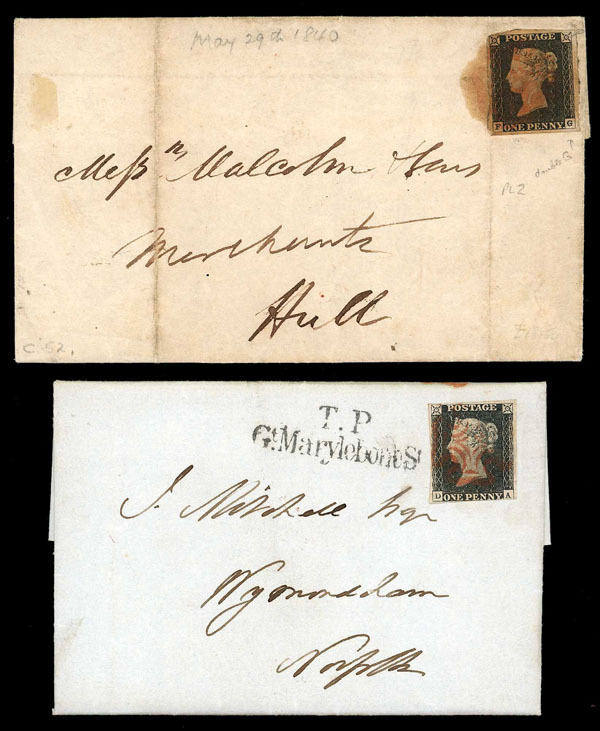 U.S.; Postmasters' Provisionals, St. Louis, Mo., 1845, 10¢ Black on Greenish on Cover, #11X2, good to large margins all round, pen cancelled and tied, on dated 1846 Florida to Philadelphia with red St. Louis MO postmark at left with straightline "Paid", horiz. fold, a Very Fine cover, 2005 P.F. cert. U.S.; General Issues, 1847, 5¢ Dark Brown, Pair on Missouri Cover, #1a, vert. 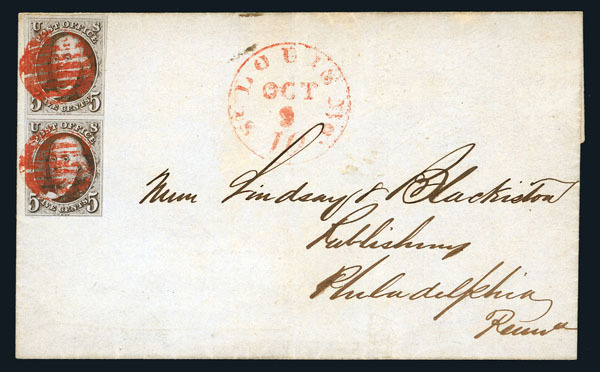 pair, clear to large margins all round, prepaying the 10¢ rate with beautiful red grid cancels and matching St. Louis Oct. 9 postmark, on folded address sheet to Philadelphia to Lindsay & Blackiston Publishing, a Very Fine cover. Ex Alexander. 2011 P.F. cert. Scott $2,000 + (off cover). 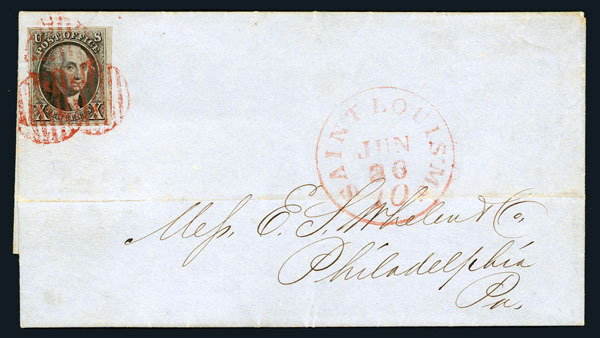 U.S.; General Issues, 1847, 10¢ on 1851 St. Louis Cover, #2, good to huge margins all round, extremely fine copy, tied by sharp red grid cancels on folded letter 26 June to Philadelphia, prepaid 10 cent rate, horiz. fold doesn't detract from this beautiful cover, a Very Fine cover. Letter from L.A. Bennett enclosing payment in the amount of $5165 for invoices due to E.L. Whelan & Company. 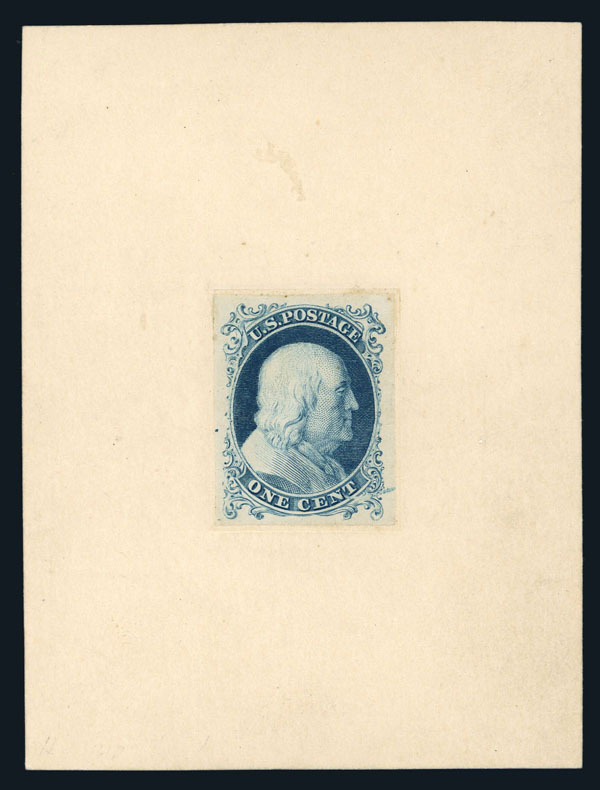 P U.S.; General Issues, 1857-60 (1875 Reprint), 1¢ Bright Blue, Small Die Proof, #40P2, mounted to resemble a large die proof, interesting smear at lower right, otherwise Very Fine. Ex. Finkelburg. 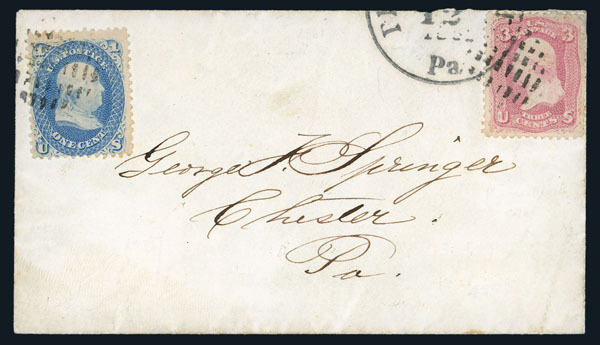 U.S.; General Issues, 1861 3¢ Pigeon Blood Pink on Cover, #64a; 63, "Stamps small corner fault at top right", to Chester, PA, along with 1¢ paying the Carrier fee plus 3¢ domestic postage, tied by matching grid cancels and partial Philadelphia, PA 1861 cds, very attractive and rare usage; small flap damage, Very Fine. Ex. Alexander and Pacetti. 2015 P.F. cert, 1973 P.F. cert (photocopy). Scott $5,045. The finest of only three recorded 1¢ blue and 3¢ pigeon blood pink combination usages . E U.S.; General Issues, 1867, 10¢ J.M. Sturgeon Essay, Without "Cancelled", in Dark Carmine, #79-E10b var, horiz. pair, die on wove, rough impression, strong color, wide side margins, partially cut in at top and bottom, Fine. E U.S.; General Issues, 1869, 5¢ Washington Essay, Completed Die on India Die Sunk on Card, #115-E1b, 4 examples on full cards with deep yellow brown, blue green, orange and scarlet, Extremely Fine. Ex Finkelberg. 2006 P.F. cert (deep yellow brown). 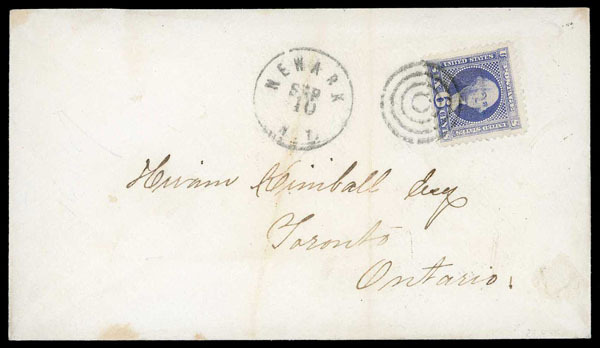 U.S.; General Issues, 1869, 6¢ Ultramarine on Cover to Toronto, #115, sound example tied by 4 ring target and Sep. 10, Newark, NJ cds to Toronto, Canada, Fine to Very Fine. 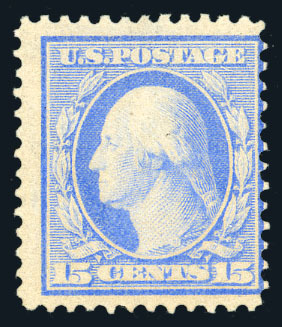 o U.S.; General Issues, 1869, 15¢ Brown & Blue, Type II, Vignette Shifted, #119, used, unusual example; small corner crease and thinned perf bottom left, Fine, 2013 P.S.E. cert. 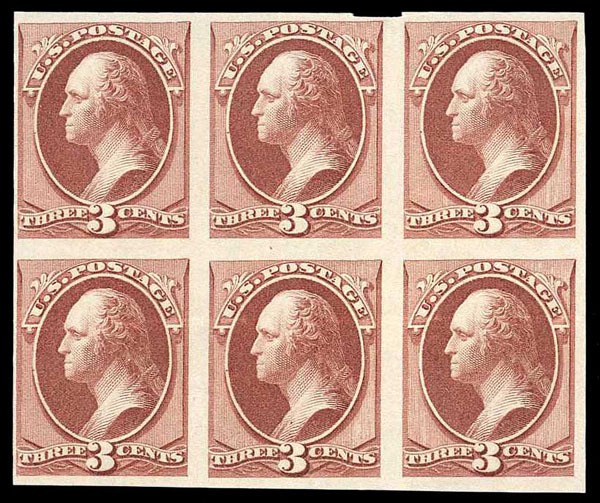 P U.S.; General Issues, 1870, 3¢ Deep Red Brown, Trial Color Plate Proof on Wove, #147TC5, block of 6, some faults incl. light horizontal crease, otherwise Fine to Very Fine. The sheet that came onto the market was folded and creased. 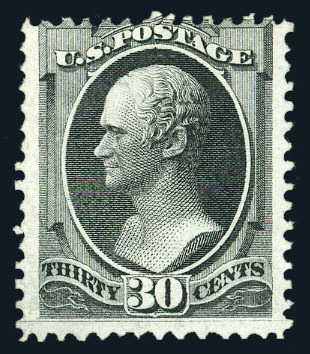 E U.S.; General Issues, 1870, 12¢ to 90¢, N.B.N.C. 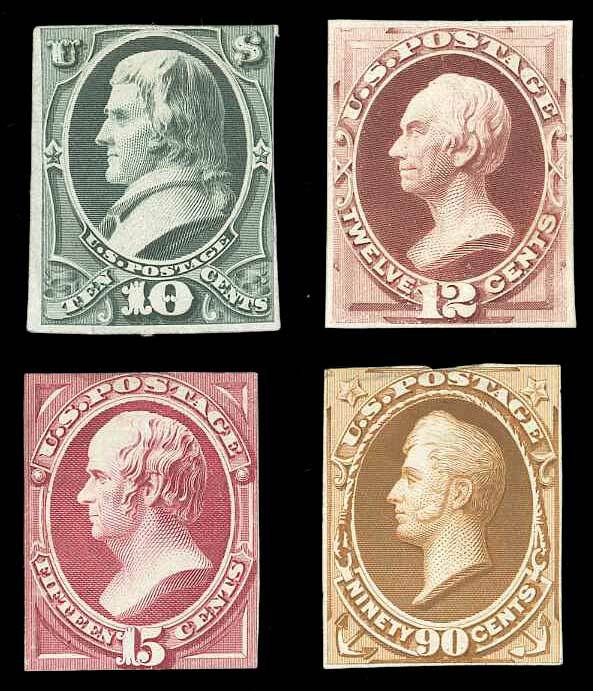 4 Different Essay Values, #150-E3a, 151-E9a, 152-E7, 155-E5, on India paper, 10¢ slate, 12¢ dull red, 15¢ rose carmine, and 90¢ orange brown, all reduced to stamp size, small faults as to be expected, still Fine. Scott $3,050 as full size. ( ) U.S.; General Issues, 1870, 30¢ Black, #154, unused, perfs touch at top, excellent color, Just Fine, 2018 Crowe cert. 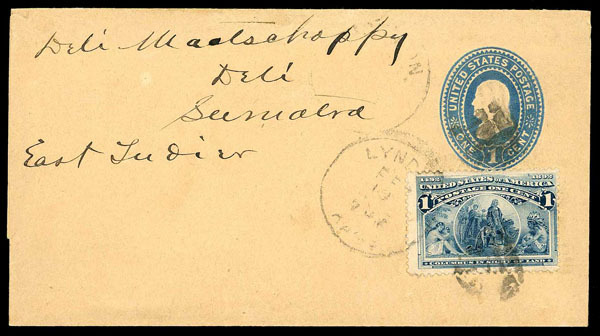 U.S.; General Issues, 1893, Columbian, 1¢ Deep Blue on Wrapper to Deli, Sumatra, Indonesia, #230, Tied by indistinct strike of Lyndon Mass. 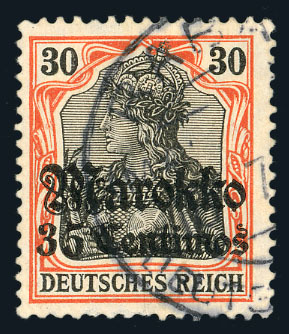 circular datestamp, Very Fine. Ex World's Fair Collection. Rare use of the Columbian issue on a wrapper to Indonesia . 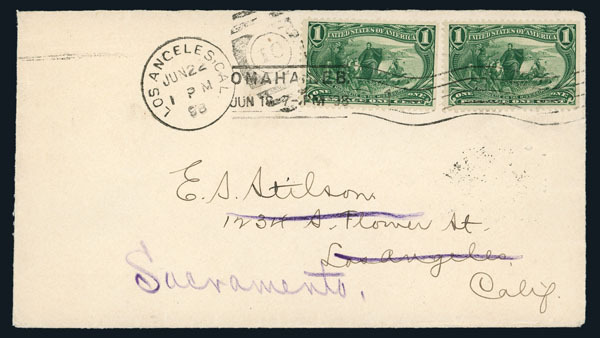 U.S.; General Issues, 1893, Columbian, 5¢ Used With Samoa, 1887, 2½d on Cover to Rotherham, England, #234; Samoa 14b, stamps affixed at origin, 2½d tied by light strike of Apia circular datestamp, 5¢ tied by "San Francisco Cal." 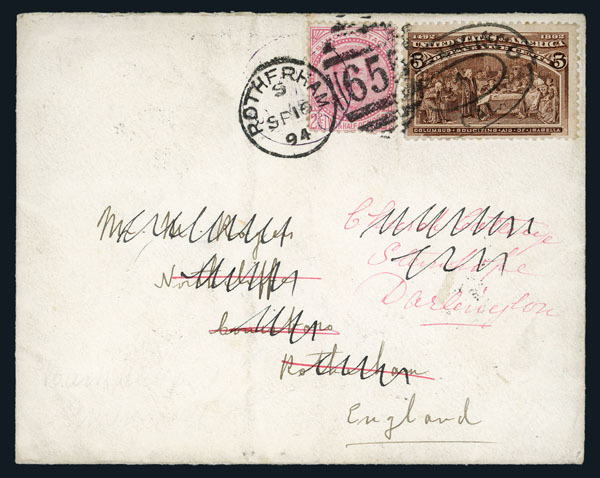 oval cancel, forwarded to Darlington, lovely mixed franking. Ex World's Fair Collection. 1981 P.F. cert. This appears to be a non-philatelic use of the Columbian Issue. It was the subject of an article in the first Opinions book published by The Philatelic Foundation . U.S.; General Issues, 1898, Trans-Mississippi, 1¢ (2), Tied By "Omaha, Neb. Jun. 18 7-PM '98" Machine Cancel on EKU Cover, #285, se. at right, to Los Angeles Cal. and forwarded to Sacramento, left stamp also tied by "Los Angeles Cal. Jun. 22 1PM 98" duplex, transit and receiving backstamps, a Very Fine cover. The Exposition was open to the public from June 1 to November 1, 1898. The stamps were not ready in time for the opening, and the official First Day was June 17. The 1¢ June 17 First Day Covers are known from Washington D.C., New York and Pittsburgh, but none known from Omaha, home of the Exposition. 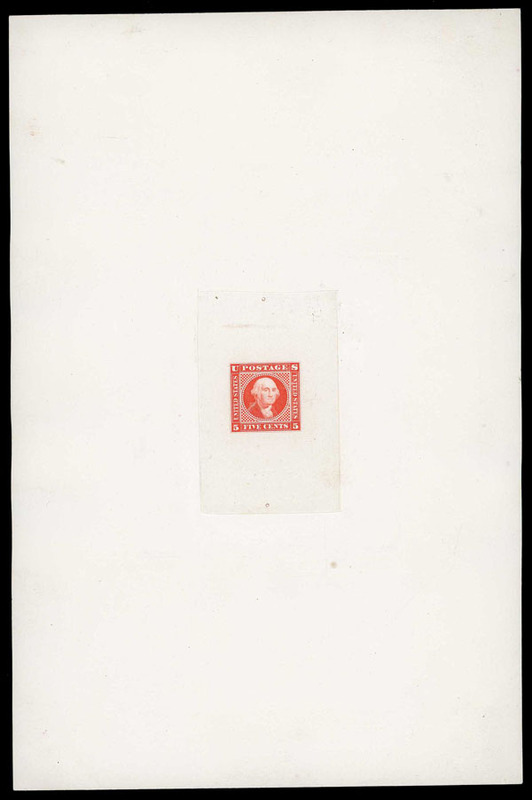 The cover offered here, postmarked one day after the stamps were issued in Omaha, is a significant use, Ex World's Fair Collection. 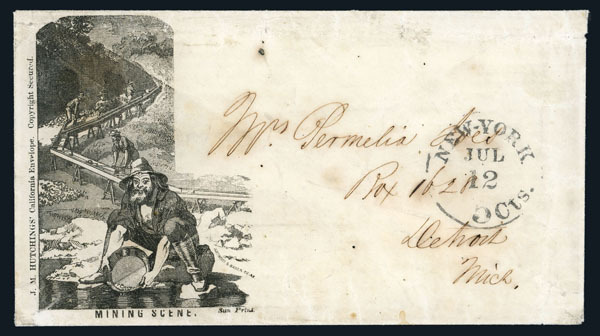 This is the earliest reported example of the 1¢ Trans-Mississippi issue used from Omaha, Nebraska, which was the home of the exposition, wonderful showpiece . o U.S.; General Issues, 1910, 4¢ Orange Brown, Vertical Coil, Pair, #350, light black cancel with additional blue pencil markings at left, Very Fine, 2010 P.F. cert. o U.S.; General Issues, 1910, 4¢ Orange Brown, Vertical Coil, Line Pair, #350, used, Fine, 1990 P.S.E. cert. 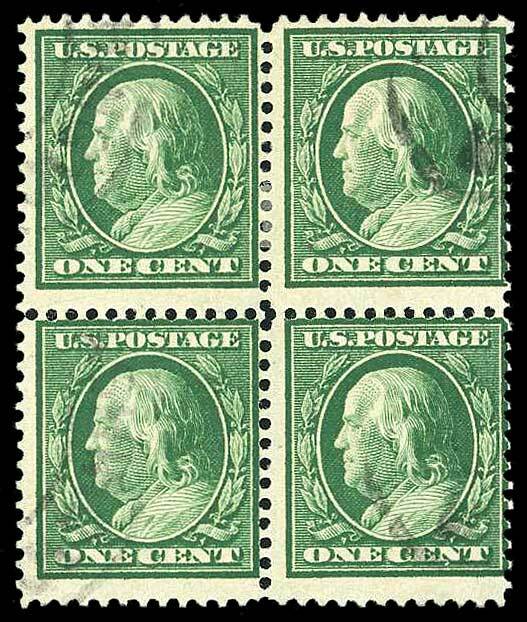 o U.S.; General Issues, 1909, 1¢ Green, Bluish Paper, Block of 4, #357, light double oval cancel, Just Fine, 2017 A.P.S. cert. U.S.; General Issues, 1909, 15¢ Pale Ultramarine, Bluish Paper, #366, n.h., centered right, fresh, Fine for this, 2018 P.S.E. cert. 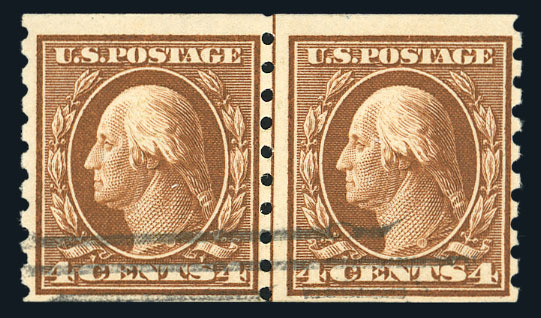 o U.S.; General Issues, 1912, 4¢ Brown, Horizontal Coil, Line Pair, #395, used, Fine appearance.